Six months ago, Morelia was five minutes away from relegation. Locked in a death race with Jaguares de Chiapas, Morelia appeared doomed with five minutes left in their clash against Monterrey. Following a crass foul from Emmanuel Loeschbor, Dorlan Pabon correctly took a penalty kick that tied the match, potentially sending Monarcas down into the Ascenso MX. With no other choice than to push everyone forward, Morelia lunged towards a sterling chance in the 91st minute. A picture perfect cross from the right side found Miguel Sansores, one of two Morelia players in the box against four defenders. Sansores misfired on the header attempt, brushing the ball with his back, and inadvertently placed a perfect pass for Raul Ruidiaz, who closed quickly behind him. The goal gave Morelia a 2-1 win in arguably the toughest place to play in Liga MX and saved the team from a dire fate: not only would Monarcas have gone down, but their owner, TV Azteca, was already in talks to sell the team off -- likely dooming the club to years of toiling in the lower division, or worse -- to fold or relocate. This weekend, Morelia will return to Monterrey, once again with their backs against the wall. It's not relegation, however, that the Michoacan-based team will have to worry about. Monarcas travels once more to the Estadio BBVA Bancomer looking to stave off elimination from a league semifinal no one saw them participating in the first place. Off the backs of their miraculous goal to stay up, Morelia is now searching for its first league title since 2000. "That was our rebirth," said Morelia defender Gabriel Achilier. "We believed from then on in ourselves and what we could do. We like [Monterrey's stadium] -- we'll try to play against them at the same level, like we've done." They'll need all they can muster against a Monterrey team that seems destined to win it all this Apertura 2017. Los Rayados are both the league's strongest offense and defense, with 29 goals scored and 12 goals conceded. Knowing full well they'd close out at home, Monterrey played sensibly and with an emphasis on defense in Morelia during the first leg -- despite the conservatism, they eked out a 1-0 win that sets them up for the return. Morelia needs to win by two goals to keep their dream season alive -- a task only one team was able to complete against Monterrey all season long: Puebla defeated them 2-0 with two goals from Canada international Lucas Cavallini. Only twice this season did Monterrey allow more than one goal in a match, regardless of the final result. Once more, it'll likely be Raul Ruidiaz who will be called upon to deliver the miracle. The 27-year-old Peruvian forward is high off his country's first World Cup berth in 34 years, and has once again delivered a massive season for Morelia, with nine goals during the campaign. The former Universitario man has scored an astounding 31 goals in 53 matches since arriving in Mexico. Unsurprisingly, according to FiveThirtyEight, Morelia faces a daunting task on Sunday. The site's SPI gives Monarcas just an 11 percent chance of eliminating Monterrey. Los Rayados are looking to make their second league final in 18 months. After reaching the Clausura 2016 final, Mohamed's heavily favored squad fell to Pachuca in dramatic fashion. Raul Ruidiaz has been excellent Morelia this season. Then again, Morelia has been defying odds all season long. As late as August, the SPI give them a 29 percent chance of making the playoffs. By late October, the number had jumped to 89 percent following their strong performances. Roberto Hernandez, the team's manager, has been especially to blame for the team's dramatic reversal of fortune. The former defender won a title in the second division with Neza back in 2013, and stepped in to relieve Pablo Marini after six games in the Clausura 2017. Having coached 34 games since then, he's notched 15 wins, 9 draws and 10 losses, steering his team from next to last in the relegation table to an impressive seventh, above Chivas. "We'll die trying, we can't think this is over," said Hernandez after the semifinal's first leg. "We were the best visiting team this season, we know it won't be easy but we'll look to make it through." 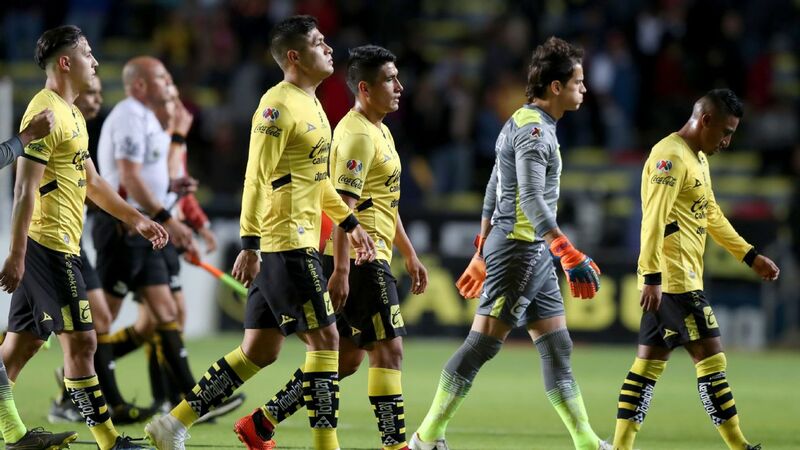 Though it'll be hard to convince anyone outside the Morelia locker room about the likelihood to pull a shocker over Monterrey, it seems all but certain the presumptive finalists will not have an easy time on their way towards a final against Tigres, their biggest rivals. After all, last time they were in Monterrey -- no one expected what happened then either.